There are lot of people online who play with Google Homepage everyday in one or the other way., One like that can be found on MRDoob’s page which is given below. 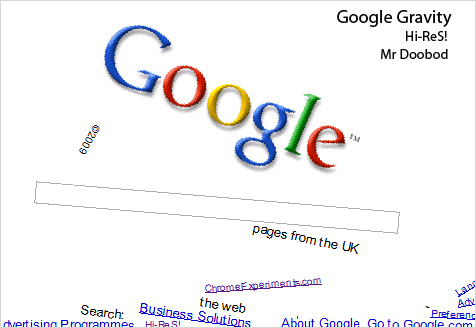 The MR Doob team have designed a webpage in which Google Homepage falls down from the top as soon as you move cursor inside the page. You can also click on the fell down Google homepage to move them to top, to make them oscillate and play with it. This works best on Google Chrome, But you can also try this on Firefox with limited options. Now visit Google.com again and enter Google Gravity in the search box. You can also visit this link for getting instant access to the Google Gravity webpage.